20.20 GMT+2 The police headquarters have just announced that there are 28 detainees, 5 arrestees and 25 injured cops in hospital, in Athens. 19.20 GMT+2 People start gathering outside the Athens police headquarters in Alexandras Avenue, in order to demand the immediate release of all detainees. More people are needed on the spot. The total numbers of detentions and/or arrests of the day are to be confirmed later on. In Monastiraki Square cops threw tear gas on protesters, as well as inside the metro station. 19.00 GMT+2 Clashes are reported in Monastiraki area. Exarchia neighbourhood is under complete police occupation, with many people beaten up and even detained by uniformed and plainclothes cops. 18.30 GMT+2 Massive police raid in Exarchia Square. Cops are chasing people through the streets. 18.15 GMT+2 In Athens alone, at least 15 detentions and 12 arrests have been confirmed. Ongoing clashes in Stournari Street in Exarchia. 18.00 GMT+2 In Thessaloniki many protesters have remained in the Labour Centre, protesting against the harsh repression and demanding the immediate release of all detainees. There’s an ongoing assembly of nearly 80 people there. Syntagma Square was evacuated by the police that did not hesitate to attack blatantly even elderly strikers earlier (there was a constant urgent need for medical help at the square). In addition, numerous units of motorcycle cops at the Columns of the Olympian Zeus (Olympieion) were blocking people from leaving. Earlier a diverse crowd attacked the National Bank of Greece, trashing it inside. It must be noted that base unions, anarchist/anti-authoritarian blocks, neighbourhood assemblies’ blocks, student unions were also among the demonstrators today. Tomorrow, October 20th, strike mobilizations across Greece will reach their peak against the voting of the new Finance multi-bill imposed by the government and the troika. 17.30 GMT+2 In Athens alone, at least 10 detentions are reported so far. 17.10 GMT+2 According to Indymedia Athens, photo-reporters asked other demonstrators not to take their gas masks! 17.00 GMT+2 Generalized clashes all around Syntagma at the moment; in particular, in Voukourestiou, Mitropoleos and Filellinon streets. The bulk of the demo has been pushed away from the square, but many people resist and counter-attack the police. The air downtown seems filled with gas and fire smoke. 16.30 GMT+2 A coordinated police attack underway at Syntagma; head to head clashes with cops. Still thousands of people try to remain on the square despite shock grenades and tear gases. 16.20 GMT+2 Mainstream media report almost nothing regarding the strike mobilizations across the country, and merely reproduce the statement of the Finance minister Evangelos Venizelos who allegedly said to all MPs inside the parliament that if they won’t vote in favour of the government’s multi-bill ‘there will be no tomorrow’. So we say: Smash the State and the Capital! Future for the struggling people! A huge black block was attacked by a massive police force in front of the ministry of Finance in Karageorgi Servias Street, in Syntagma Square. 16.00 GMT+2 People are pushed away by police thugs to Panepistimiou Street and Omonia Square. In the upper side of Syntagma the street battles go on. Cops clash with people there, using tear gas extensively. 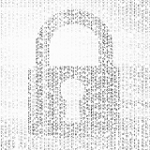 The pacifist block of ‘Den Plirono’ (I won’t pay!) movement factually defended other protesters against cops at Syntagma, according to one more live correspondence on Athens free radio 98 FM. A police officer dared to speak with a loudspeaker, urging people to leave the area. A loud and clear ‘BOO’ was immediately heard from the side of demonstrators. At the same time, Mitropoleos Street was blocked off by police, in a growing attempt to encircle the whole of Syntagma Square and disperse people from the area. Meanwhile, the water cannon was spotted next to police buses several kilometers away, in a northern district of Athens. 15.50 GMT+2 In alleys around Ermou Street fascists with smashed heads are helped to escape with ambulances. Many protesters in Athens are reported injured and in need of hospitalization. Thick black smoke can be seen in front of the rectorate at Propylaea. In Serres, northern Greece, the demo counted as much as 1,300 people. Protesters demanded that all shops close because of the strike. Just before the end of the demo, a fast food shopkeeper threatened mostly young protesters, then threw sulfuric acid against several people and threatened them with a big knife! 15.40 GMT+2 In the upper side of Syntagma the majority of protesters support insurrectionist tactics now. Some even shouted ‘Let’s see how the mass media will blame the “hooded ones” tonight!’ implying that everybody is eager to defend the demo against state repression. Six detentions in Volos; demonstrators are headed towards the police headquarters. It is also confirmed that earlier the police raided the Immigrants Hangout in the same city. 15.30 GMT+2 A police operation is in progress along Akadimias Street; head to head clashes with the cops. Clashes in front of the Unknown Soldier Monument continue, at the bottom of the staircase leading to the parliament. Despite tons of tear gas fired by the police, people are not leaving Syntagma area. Earlier the taxi drivers union along with other protesters held barricades in Akadimias Street and fought with pigs in uniform; for a while the only street with access to Syntagma was Stadiou Street. 15.15 GMT+2 After the demo in Thessaloniki, barricades were erected outside the Labour Centre. 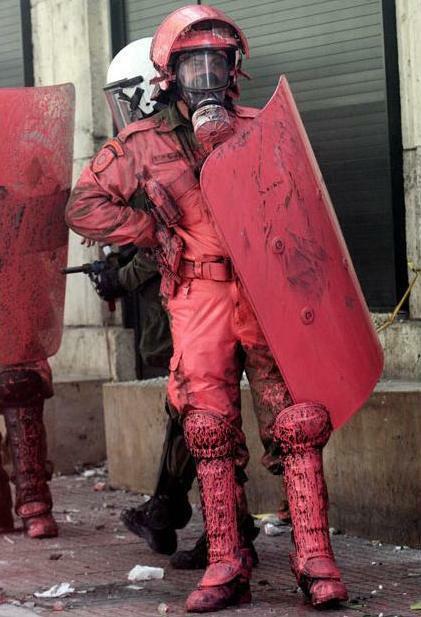 Massive repressive operation followed; at least three detentions so far, and one young woman injured and hospitalized. Police raided the building of the Labour Centre where demonstrators had fled to. Successful demos took place in numerous Greek cities, including Kalamata, Sparti, Nafplion, Preveza, Igoumenitsa, Orestiada, Kozani, Xanthi and Komotini (where comrades from the anarchist hangout Utopia A.D. also participated in the mobilizations). In Larissa about 12,000 took to the streets. 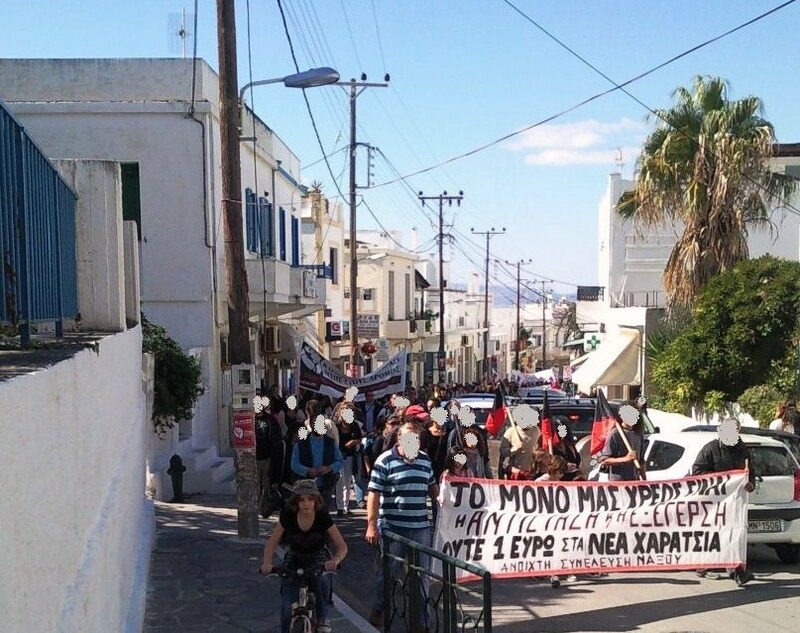 In Patras the march has ended (the anarchist block of Ergalioforos collectivity alone, counted circa 600 people). Volos and Ioannina both had dynamic demonstrations of around 10,000 strong. In Kavala more than 5,000 people took to the streets in one of the largest local demonstrations of the last decades —the Labour Center there has been occupied by demonstrators. On Kerkyra Island more than 3,000 people took to the streets, as on many other islands. On Lesvos Island about 1,000 people participated in the demo which ended around 14.00 GMT+2 and was followed by the occupation of the prefecture’s premises. There is an ongoing assembly at the occupied building. 14.50 GMT+2 In Syntagma the guardhouse in the Unknown Soldier Monument is set on fire. 14.40 GMT+2 Gas was shot straight into crowd at Panepistimiou metro station. In Syntagma the police wall was torn down by people; clashes with Molotov cocktails and stones there. Cops hurdle stones back at protesters. The first burning barricades are up high in Akadimias and Voukourestiou streets. Police squads are blocking the entrance to Syntagma from there. Large-scale clashes in Akadimias Street and clashes in front of banks next to the university rectorate in Panepistimiou Street. People in Syntagma are moving, flooding the Unknown Soldier Monument, while shock grenades sound out all around Syntagma. At least four police squads have rushed from Propylaea towards Syntagma Square. Many striker blocks have dispersed in Panepistimiou Street, and comrades call for people to join them in front of Propylaea in order to occupy the rectorate building. In Kolokotroni Square in Stadiou Street fascists along with army retirees were seen chasing hooded protesters. 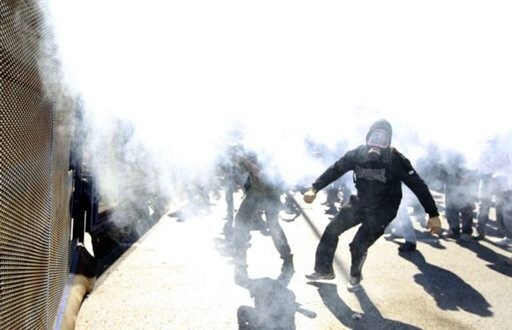 In Thessaloniki police attacked strikers with tear gas in front of the General Secretariat for Macedonia and Thrace, and most people were headed to the Labour Centre. 14.20 GTM+2 The Stalinists withdraw from Syntagma, beating small groups of other demonstrators on the way! Other people chant, ‘No pasaran!’ The crowd is amazingly thick. Taxi owners/drivers line up in Panepistimiou Street. 14.10 GTM+2 In Thessaloniki cops threw tear gas and attempted to split the demonstration in two parts, beating fiercely several protesters in the process. Meanwhile, some people swore at hooded youths. Now the demo is moving again to reach the General Secretariat for Macedonia and Thrace. In Syntagma police used tear gas and shock grenades extensively in front of the plexiglass-iron wall which blockades Vassilisis Sofias Avenue next to the side of the parliament; protester blocks were pushed away due to the chemicals. People shout ‘Down with PASOK’s junta’ and ‘Cops–Pigs–Murderers’. The streets are flooded, literally; in fact, marching is impossible because the entire city centre is a vast rally. People walk even from the sidewalks towards the parliament. 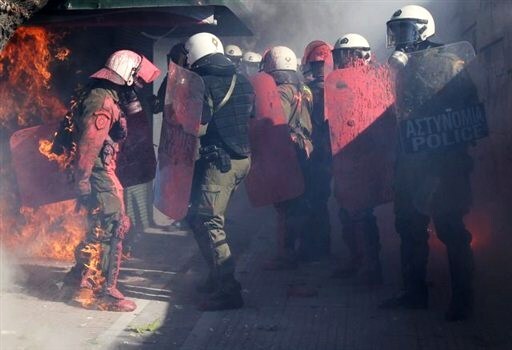 In Zalokosta and Akadimias streets riot police attacked the municipal workers and taxi drivers with tear gas. Strong clashes in Akadimias Street followed. Also, previous clashes were reported near the Polytechnic School —the back end of the demo is still there. 13.50 GMT+2 Mutiny in Koridallos women’s prisons; the inmates protest against the totally inhuman conditions of incarceration and refuse to enter the prison cells in solidarity with the strikers. Strikers are trying to move the police wall on Vassilisis Sofias Avenue; cops are wearing their helmets and new police units are moving from the back of the parliament towards the wall; shock grenades were thrown. At least 10,000 protesters in Heraklion on Crete Island; attacks on banks and a police car were reported. In Agrinio nearly 3,000 people attended the gathering in Irinis Square. Also, in Trikala about 30 anarchists took to the streets. In Thessaloniki clashes have erupted between demonstrators, as circa 100 insurrectionists attacked on stores, banks, etc. in Tsimiski Street. In Syntagma people complain about other protesters who are in a combative mood. 13.40 GMT+2 In Panepistimiou and Aiolou streets several people from the block of the School Teachers Federation of Greece were seen beating some secondary students! 13.20 GMT+2 In the lower part of Syntagma Square there were conflicts between alleged football hooligans —it remains to be confirmed whether they were chased off by PAME demonstrators. 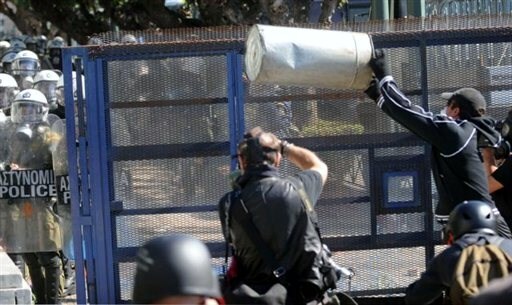 13.10 GMT+2 Athens corporate media reported the detentions of four 14-year-olds accused of possession of Molotov cocktails. It has been confirmed that they were arrested inside an urban bus on their way to the demo. Meanwhile, a slight fascist menace is reported as nearly 300 retirees of the Greek army were spotted in Kolokotroni Square holding national flags, and dozens of flyers of the neo-Nazi Chrissi Avgi (Golden Dawn) are found throughout the centre of Athens. 13.00 GMT+2 The demo of the Stalinist PAME union continues to pour into Syntagma; their size is huge. Meanwhile, the main demo currently extends from Syntagma to the Polytechnic School in Patission Street but will take a while to move —it’s just too big. Occupied London comrades have walked around the entire demonstration route, and the crowd is unprecedented. 12.50 GMT+2 In Patras nearly 5,000 protesters took to the streets and several blocks have occupied the building of the Western Greece Periphery. 12.30 GMT+2 In Thessaloniki at least 10,000 demonstrators have gathered so far, headed from Kamara towards the Labour Centre. In Livadia about 2,000 people march and close down super-market chain stores. 12.00 GMT+2 The main demonstration hasn’t started yet, but Panepistimiou and Stadiou streets are already filling with many thousands of people. The police order to close down the Syntagma metro station is a potentially murderous one. The cops are not lined up in front of Amalias Avenue as usual, but are currently guarding the upper stairs of the parliament. 11.15 GMT+2 About 100 people have marched through the streets of the neighbourhoods of Kesariani, Vyronas and Pagrati. The demonstrators attacked a unit of DIAS motorcycle cops who tried to follow the demo. Several people have beaten the cops badly, smashed and threw rubbish at a pawnshop and forced supermarkets and shops that were previously open to close. It’s worth to mention that while piles of rubbish have filled the streets of Greek cities due to the ongoing strike of the municipality cleaners (garbage collectors), the sold-out union ADEDY has asked the syndicate of municipality workers (POE-OTA) to clean the streets from which the march will pass by in Athens, in order to avoid ‘unpleasant accidents’ and ‘fire eruptions’ during the 48hour general strike, confirming once again its collaborationist role as a firefighter of the social uprising. 10.30 GMT+2 Massive police presence in the centre of Athens. – 10 police squads (MAT) have been blocking Vasilissis Sofias Avenue, bordering the parliament since 6.30 GMT+2. The district of Kolonaki is also reported to be blocked off. – 20 police squads line up in Akadimias Street. More than 10,000 cops of every kind are on the streets of Athens today, prepared to oppress the upcoming demonstration. The police plexiglass-iron wall that we have seen in previous demonstrations is once more placed at the junction of the flower shops [Louloudadika] in Vasilissis Sofias Avenue. Large groups of undercover cops are dispersed in various points of downtown Athens. A team of 40 plainclothes cops guarded by (at least) one police squad is lurking at the junction of Bouboulinas and Stournari streets in Exarchia. Since yesterday, one water cannon was seen at Mesogeion Avenue. Tikkun, pick up the pieces and all will be new! !